Weeds are notorious for muscling aside crop plants for water, sunlight, nutrients, and space. But how do weeds get the jump on crops as seed lying dormant in the soil? It’s a fundamental question of plant biology and soil ecology that scientists with ARS’s Invasive Weed Management Research Unit, Urbana, Illinois, are working to answer—and in doing so, blow the seeds’ cover. Driving this basic research is herbicide use on 95 percent of the acreage in the U.S. Corn Belt and concerns over worker safety, environmental persistence, and emergence of herbicide-tolerant weeds. Of particular interest is enlisting the soil’s natural bacteria and fungi to cause decay in weed seed banks, a term that refers to the thousands, even millions, of weed seeds residing in the soil—often for decades—awaiting favorable conditions to germinate. Technician Erin Haramoto and ecologist Adam Davis inspect the prolific seed production of common waterhemp (Amaranthus rudis). Late seedling emergence, high production of long-lived seeds, and the ability to grow rapidly in hot conditions make the plant a serious problem for soybean growers. Since 2002, Chee-Sanford has been piecing together conditions under which certain microbes attack banks of common annual weeds. Some microbes are content to eat carbon and other nutrients present in the soil or exuded there from seeds, while others use powerful enzymes or other means to breach the seed, steal its nutrients, and cause decay. “We’re trying to identify specialist microbes that are adept at initiating seed decay, but seed decay may be a multimicrobe effort,” notes Chee-Sanford. In one study, 99 percent of velvetleaf seeds underwent microbial decay after 3 months, particularly when they were the only source of carbon available as food. Species of Bacteroidetes and Proteobacteria, which are found in many soils and are known to degrade natural polymers, are the prime suspects in the seeds’ decay. Uncertain is whether they’re the initial cause of it. Many studies have addressed the fate of herbicides in the presence of oxygen (aerobic). But little information is available on microorganisms that degrade herbicides in anaerobic (oxygen absent) soils—such as those that are flooded. Sims is helping fill the information gap with studies of bacteria that degrade dinitroaniline herbicides like trifluralin, which kills annual grasses and some broadleaf weeds. He and co-researchers have shown that anaerobic bacteria can rapidly degrade trifluralin if the soils contain clay minerals and are soggy, even if just for a few days. Iron in the clays provides the microbes with an electron acceptor for respiration in place of oxygen. The iron, in turn, changes to a form that reacts with the herbicide and inactivates it. Predicting conditions that can inactivate a herbicide could provide environmental specialists with a means for bioremediation of herbicide spills or help farmers time seasonal applications of herbicide. In another study, Sims and collaborators discovered that the soil bacterium Desulfitobacterium chlororespirans can degrade the herbicides bromoxynil and ioxynil—and a common metabolite of bromoxynil—under anaerobic conditions. It strips the herbicide of bromide and iodide atoms and uses the herbicide and its metabolite as electron acceptors for growth. Few herbicide-degrading microbes can be grown in pure culture, so Sims and his group are adapting a method called “DNA stable isotope probing.” It identifies organisms growing on carbon and nitrogen from herbicides, without having to recover them from the soil. This technique could provide information previously unattainable with traditional microbiological approaches. Weed-suppressive traits, such as crop height, leaf area, and growth rate, vary widely among sweet corn hybrids. Ecologist Marty Williams measures solar radiation intercepted by different sweet corn hybrids to determine how canopy structure affects the crop’s ability to compete with wild proso millet. 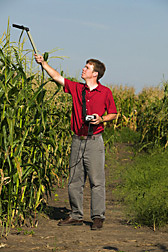 In simultaneous field studies, Urbana ecologist Martin M. Williams II and agronomist Rick A. Boydston, in Prosser, Washington, are comparing the ability of sweet corn hybrids to withstand infestations of wild proso millet, a fast-growing annual weed for which few herbicides are registered. Williams says the study, now in its second year, shows a strong correlation between a crop’s canopy thickness and its ability to tolerate and suppress weeds. Spirit, the corn hybrid with the least-dense canopy, lost up to 70 percent of its yield and allowed more weed-seed production than the hybrid with the thickest canopy, GH2547, which suffered minimal yield losses. On the genetics front, says Williams, “We’re addressing one of the biggest weed-management concerns voiced by the sweet corn industry, namely that some cultivars are being damaged by newer, more environmentally friendly herbicides.” Along with Jerald K. Pataky and Dean E. Riechers, both with the University of Illinois at Urbana-Champaign, he’s found that a single recessive gene causes sensitivity to Accent and Callisto, herbicides with very different actions within the plant. Meanwhile, ARS weed ecologist Adam S. Davis is underseeding crops of wheat with red clover to coax birds, rodents, and insects to eat more weed seeds. The clover sprouts beneath the crop as temperatures rise, providing seed-eaters with cover while they forage. 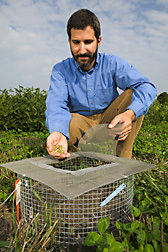 Using custom-made cages baited with seed, coupled with computer modeling, Davis is compiling data for a yearly estimate of the impact of such predation on weed populations. He’s also comparing the clover-wheat combination with clover-free crops of corn and soybean. If creating a haven for such critters sounds far-fetched, consider this: A single female cricket will eat up to 50 seeds a day. Mice and ground squirrels eat even more. Another project is aimed at helping organic growers, who rank weeds as their number-one production problem. Davis is conducting field surveys of weed-seed concentrations on soil surfaces, in cracks, and on upright plants during harvest. He’ll furnish the information to agricultural engineers who can use their technical know-how to build what Davis calls a “weed-seed predator combine kit.” As he envisions it, the kit would include a vacuum head and special hammers for sucking up, crushing, and spitting out the destroyed weed seeds as the combine drives through the field harvesting the crop.—By Jan Suszkiw, Agricultural Research Service Information Staff. 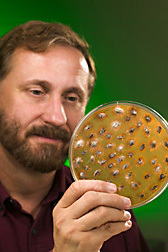 This research is part of Soil Resource Management (#202) and Crop Protection and Quarantine (#304), two ARS National Programs described on the World Wide Web at www.nps.ars.usda.gov. To reach scientists mentioned in this article, contact Jan Suszkiw, USDA-ARS Information Staff, 5601 Sunnyside Ave., Beltsville, MD 20705-5129; phone (301) 504-1630, fax (301) 504-1486. "Unearthing New Clues To Controlling Weeds" was published in the May 2006 issue of Agricultural Research magazine.